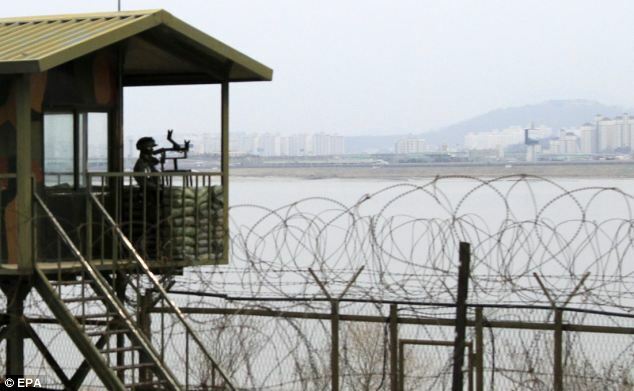 South Korean soldiers have shot dead a man trying to swim across a border river into North Korea, officials say. Troops opened fire after the man jumped into the Imjin River and ignored repeated warnings to stop. North Korea and South Korea remain technically at war after the 1950-53 conflict ended in an armistice and not a peace treaty. Instances of trying to cross the heavily-militarized border in broad daylight are extremely rare. The man, who has not yet been identified, was spotted by guards near the western border in Paju, north of Seoul, at around 14:23 local time. Soldiers fired off warning shots and told him to return to the South. When he disobeyed the order and jumped into the river, he was shot dead, military officials told Yonhap news agency. A military spokesman also told the AFP news agency that the man’s body has been retrieved. But the North withdrew all of its workers in April, as ties between the two Koreas deteriorated in the wake of Pyongyang’s February 12 nuclear test. Reopening Kaesong complex has taken months of negotiation.